What is needed in this age of fragmentation and disconnection? How do we find our way back to a future, or even the present moment of integrative, connected and conscious living? What are the tools we need to come back to ourselves in ways that support our Wholeness and that are in service to our community, local or global, human and other-than-human? What fundamental survival skills do we need to learn as a species in order to survive the overwhelm of an unintact, desensitised and often traumatising environment that some of us find ourselves in? There are many things that I would say need to happen for this shift to take place and on a fundamental level I believe it is necessary for us to develop an awareness of our physical bodies in order to track our internal landscape. We need to do this in order to stay attuned to our emotions and other physical sensations because these are the clues that lead us to a deeper understanding of how we respond in certain situations and what, therefore, we might need to support us to stay in connection. There are many tools that can support this process and I will not be going in to them here but please know, if you don’t already, that there are tools. And what I wish to share here is more personal and present than a general resource-sharing piece of writing. Very recently I witnessed two children who were out in some woods with their family (I was with the family). Without anyone saying anything they ran towards the trees saying excitedly, “Let’s make a shelter!”. Their uncle (my partner) promptly picked up on the enthusiasm and began building a shelter with them. It didn’t take long for me to get involved. I was participating on a Soul-focused program that looks at different aspects of the psyche through a nature-based map and the invitation was to go out on the land from the perspective of the inner child. Without thinking I found myself building a shelter for myself. I did this whilst singing, humming, banging sticks together and generally entering into a below-the-brain, body-led state that also lent itself to timelessness – something the child knows and needs. The mirroring (reflecting) of this story (my own and that of the experienced guide) told me that the child of me needed to know she was safe. That some instinctive, innate part of myself knew that was what I needed in order to feel my inner safety. I would like to add here that I was in a part of the world where large bears are seen regularly as well as the presence of coyote, rattle snake and scorpions. 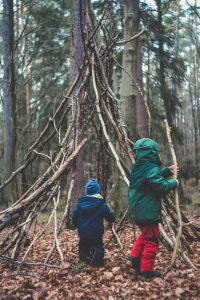 After building the shelter in the woods with my partners nieces I began to wonder if children simply know what they need in order to feel safe (and this can include having fun at the same time). That perhaps there is something in all of us as children and adults that needs to feel safe and, more significantly, knows how to do it. Let me clarify something here, my life nor physical well being were never under threat as a child, yet on some level, as I began to realize some years ago in the unearthing of my inner world, I saw that I hadn’t felt safe emotionally or, sometimes, psychologically. There is also the aspect of this story that reveals a need for the child of me to have my own space and to create that myself, on my own terms, in my own timeless time. This is about boundaries. The need for clear boundaries is key, I feel, to creating safety for ourselves. And it is something that many, actually most, of us do not learn to do until, if ever, we’re in our adulthood. So, I would like to suggest here that part of how we learn to survive in this world is actually quite instinctive, is already known somewhere deep inside our psyches and also our bodies. The nervous system and our whole neuro-biology is wired for safety and recognises it instantly. What can often happen, however, is that our hard-wiring gets hijacked by other incoming stimulus. This can look like many different things – physical abuse and violence, neglect, verbal abuse, psychological abuse, accidents, and the less obvious but still harming are the incremental scenarios of not feeling welcomed (neglect again), made to feel we don’t belong because we’re different, not being celebrated, encouraged, supported to shine our gifts, not being listened to/not being fully heard or understood, being told we’re stupid time and time again. There is also the larger, more collective piece of not having the ‘village’ to support us to grow (up) in a good way; the isolation from others, the education system that most of us endured, the class system, lack of nature connection, absence of regular creative expression through singing, dancing or otherwise, and the lack of grief tending for all of this. The list is actually endless. So then we find ourselves in a survival situation – a situation where the sense of steady, grounded and calm selves, our well-being, is being challenged. And the startling realization is – we don’t even know we’re in a survival situation. How do we support our systems, our bodies, our hard-wiring to know that we can survive the dysfunction of our culture? How do we create the conditions that allow us to feel sheltered without being disconnected, boundaried and closed, whilst feeling safe without being fearful? Maybe it’s time to go to the woods and build a shelter with an awareness of how it feels for us to do this? How does the inner child feel in the body knowing that this is her space, that she can make it anyway she wants and do whatever she wants in it or with it? What would it be to do this with intention, within the folds of ceremony, and whilst in conversation with the land, thereby asking permission, going with humility? What might this bring to the psyche and the body beyond this shelter in the woods? Maybe it’s also time to begin listening to our bodies, our sensations – contracted, tight, hot, heavy, light, fizzy to name a few that I’m familiar with. To notice how we respond when something is happening around us that has the potential to make us feel overwhelmed, tense, uneasy. Notice what thoughts arise with the physical sensations, what memories, what judgements, projections are arising. Then we can make a choice as to how we care for ourselves if it’s needed. Often, just noticing all this is enough and sometimes we need to take action ~ get away from the situation or person that’s triggering these responses, breath fully, have someone hold our hands and make eye-contact, feel our feet in contact with the earth. Just be with the earth! So, back to the woods we go………. And this doesn’t mean we need to go to the actual woods every time we feel overwhelmed, no, this can mean back to the shelter inside ourselves, to the place where we know we feel safe, where we can feel our boundaries, our autonomy, our connection to self and to the earth. Yes, this could be enough and this could be a good place to start.